Democratic Republic of Congo's renegade General Laurent Nkunda has said his forces are reintegrating into the country's national army, following an informal peace deal struck in neighboring Rwanda. 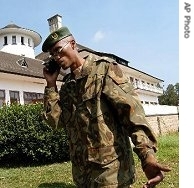 Nkunda, who led troops loyal to him into rebellion in 2004, is being sought under an international arrest warrant for war crimes. Joe Bavier has more from the capital, Kinshasa. Speaking by telephone to VOA, early Thursday, General Laurent Nkunda said his forces - estimated at between 3,000 and 5,000 soldiers - had already begun the reintegration process at a site in North Kivu Province, in Congo's volatile east. Under a verbal agreement he says was made with Congo's government and army during talks in Rwanda, earlier this month, Nkunda's two brigades will be blended with three Congolese army brigades already in North Kivu. Both Nkunda and army officials say the first of these mixed units will be presented at a ceremony, Friday. 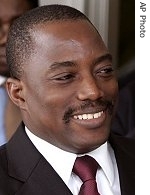 Congo President Joseph Kabila was sworn in last month, after the country's first democratic elections in more than four decades. The process marked the end of a transition period, following a 1998-to-2003 civil war that killed an estimated four million people - most through hunger and disease. More than three years after the official end of Congo's war, the country's east remains unstable, with regular fighting breaking out between government forces and armed militias. Nkunda rebelled a year after the signing of the peace deal that officially ended fighting in the broader conflict. He claims he did so to protect Congo's minority Tutsi ethnic group, of which he is a member. The general is being sought under an international arrest warrant for war crimes allegedly committed during a week-long occupation of the eastern city, Bukavu, in 2004. Nkunda says he wants the warrant repealed and plans to rejoin the army, himself.